Kansas City, Mo. On Friday, July 3, 2015, from 5-10 pm the Todd Weiner Gallery will host a reception for “Farglebargle” by Thomas Gieseke. Thomas Gieseke a Kansas City native brings together his imagined world with nuances of the native Kansas City naturescapes to create intricate illustrations. By weaving the compositions of the Surrealist Masters Gieseke idolizes, like Salvador Dali, with elements of Kansas City nature he explored as a child, Gieseke creates medium-sized acrylic paitings. These fantastical works explode across the canvas to unlock Gieseke’s fantasy. One particular piece full of both elements is “Professor Farglebargle’s Garden Party” where the show title originates. Admittedly his favorite piece, Gieseke created outrageous creatures adorned with iconic symbols. In addition to the brightly colored creatures that only exist in this fantasy world, Gieseke layered flowered leaves with their inhabitants like flies, spiders, snakes, and squirrels. However, in Gieseke’s world, it is essential for a frog to have a top hat and beer mug! 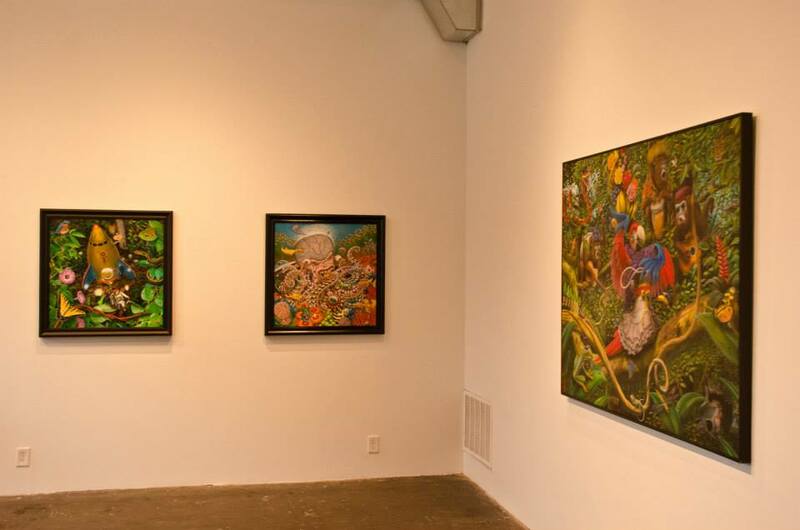 By giving glasses and a cigar to the meandering turtle Gieseke interjects his vision to the creatures of his imagined landscape. Gieseke brings twenty-five years of design experience to his illustrations. His long career has resulted in a many collaborations with acclaimed artists. His achievements include cocreating the design for the happy meal box, a feature in the American Showcase of Illustration, and a successful westcoast show in February of 2014 with the Copro Gallery.